The list of Star Wars actors hoping to see Finn and Poe Dameron get romantic on the big screen continues to grow. Previously, Laura Dern told The L.A. Times that Finn-Poe would “be the most beautiful couple ever” and that there is plenty of room for more LGBTQ community representation in the franchise. 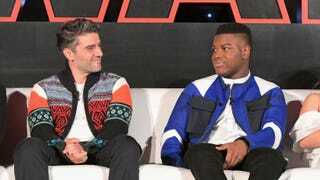 Even Kelly Marie Tran—whose character Rose may not be thrilled at the prospect of Finn being paired off with someone else—admitted to Variety that she “ships Finn and Poe pretty hard.” And now, as of yesterday morning, Finn-Poe shippers are “fully endorsed” by Poe Dameron himself, Oscar Isaac. “FinnPoe is endgame,” reads the poster that was presented to Isaac by Star Wars fan and ardent shipper Madeline. In addition to gracing said poster with his signature, Isaac wrote “Fully endorsed” underneath his name to make sure there was no confusion about his thoughts on the potential romance. After excitedly posting her photos to Twitter, Madeline shared them directly with John Boyega, requesting formally that he throw in his two cents. With Episode IX still in pre-production, there is, in theory, still plenty of time for J.J. Abrams to work a Finn-Poe plot line into the Star Wars universe. Ideally this development would be motivated by some sort of story element, but it would also be great to see the two rebel heroes just exchange a nice deep kiss, say something like, “See you at home later,” and then never address it again. But we don’t want to impose on Abrams’ creative process. However he wants to make this happen is fine with us.